Rub-ons are an effective and simple way to add intricate designs to your pages without having to draw them yourselves or spend hours cutting them out from patterned paper. 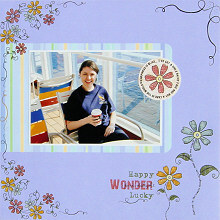 This layout uses coloured rub-ons to create a unique design with ease. This layout was created using purple Bazzill cardstock, Doodlebug Baby Boy Stripe paper, white cardstock, a scrap of pale orange patterned paper and Fancy Pants Frou-Frou Rub-ons. Cut a piece of Doodlebug Baby Boy Stripe paper measuring approximately 24cm by 15cm. Make sure your stripes are vertical. Round the top right and bottom right corners. Adhere to your background (the purple Bazzill) along the left edge approximately 6cm from the top. Mat a 5x7 photo with white cardstock. Adhere on top of your Doodlebug Baby Boy Stripe paper approximately 1cm from the right edge. Place the round rub-on on a piece of pale orange paper or cardstock and rub on. Cut out the circle and adhere towards the top right corner of your photo, as shown in the layout above. Position the rest of your rub-ons around your page, as shown above. When you are happy with their placement, rub on.